Here's a look at the feature showdowns set for Monday, April 9. The Showcase's youngest age group will play in the spotlight of MacPherson Stadium for Monday's first feature game. 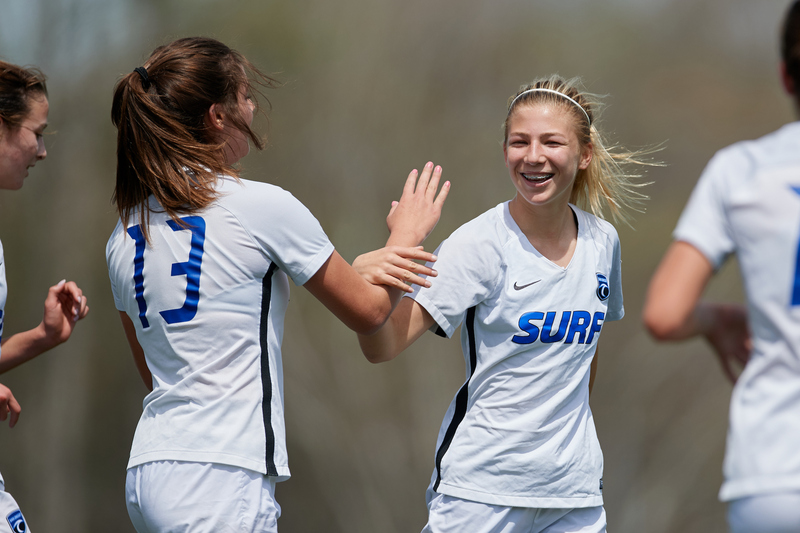 While standings aren't kept at the U-14 level and no playoffs are held, the games are competitive and the focus remains on the Academy's development pathway. This spring presents the players' first Showcase event. It provides early exposure to stellar nationwide competition and the eyes of the many scouts roaming around Bryan Soccer Park. San Diego Surf have arrived on the opposite coast with an impressive run of form. Over the past year, Surf have dropped just one game. That loss came last weekend in an otherwise unblemished spring campaign, but the California club recovered to open the Showcase with a 3-1 win over Boston Breakers on Friday and a 3-0 shutout victory over Penn Fusion on Sunday. Now, they'll look to top Nationals and leave North Carolina undefeated. Chloe Green leads the SoCal squad's attack as its leading scorer. One of the team's most consistent players, her 15 goals have come over 20 appearances. On the opposite end of the pitch, goalkeeper Nona Reason anchors the net and defenders Presley McDonald, Gillian Doogan and Preslea Wilson form a formidable trio on the back line. The Nationals have carried a balanced roster all season. Midwest weather means that their spring schedule has not lasted nearly as long as San Diego's. The Michigan-based club reopened their 2017-18 season with a 5-0 win over FC United on March 18. At the Showcase, Nationals dropped its opening tie to FC Dallas on Friday while eking out a 1-0 victory over Legends FC on Saturday. Goalscoring has been a group effort for the girls from Pontiac. Emily O'Malley, the team's most-consistent starter, has netted five times for the Nationals while Francesca Mudd, a starter for all but one game, has buried three scores this season. Lauren Mitchell has been the team's steadiest presence in the net. "Monday Afternoon Football" will see two decorated Development Academy clubs duke it out. Both academies' directors are also current NWSL head coaches: FC Fury director Paul Riley leads reigning NWSL Shield winner NC Courage while Eclipse director Rory Dames is in the midst of his eighth season at the helm of the Chicago Red Stars. Both vaunted programs have produced senior Women's National Team players and the next generation will be on display Monday, as the rosters feature several recent Youth National Team call-ups. Drawing talent from the New York metropolitan area, FC Fury has produced current WNT players Allie Long and Crystal Dunn. The Fury U-15s are led by midfielder Jillian Shimkin, a goalscoring machine for the New Yorkers who is fresh off of a camp appearance with the U-15 Girls' National Team. A Penn State commit, her 14 goals lead the team and rank sixth in the East Conference. Two strong center backs anchor the back line in Danielle Davis and Sarah DeFreitas. Davis boasts impressive ambipedal ability, noted for hitting long free kicks with both her right and left feet. She's joined on defense by DeFreitas, a Fury captain who is the club's reigning defender of the year. Chicagoland's Eclipse also has produced senior National Team talent, including current rising star defender Casey Short. A trio of recent GNT call-ups will represent the Eclipse at MacPherson Stadium: defender Emma Phillips, midfielder Devin Lynch and forward Carol Soto. The celestially-titled club has brought a stout defense to Carolina. Their second-place standing in the Mid-America division is fueled by a back line that leads the league in goals against. The attack is well-rounded. Dakota Lyons and Megan Hutchinson lead the team with eight goals apiece.